I am happy to say that I have been working away on this sweater design and it is now…. 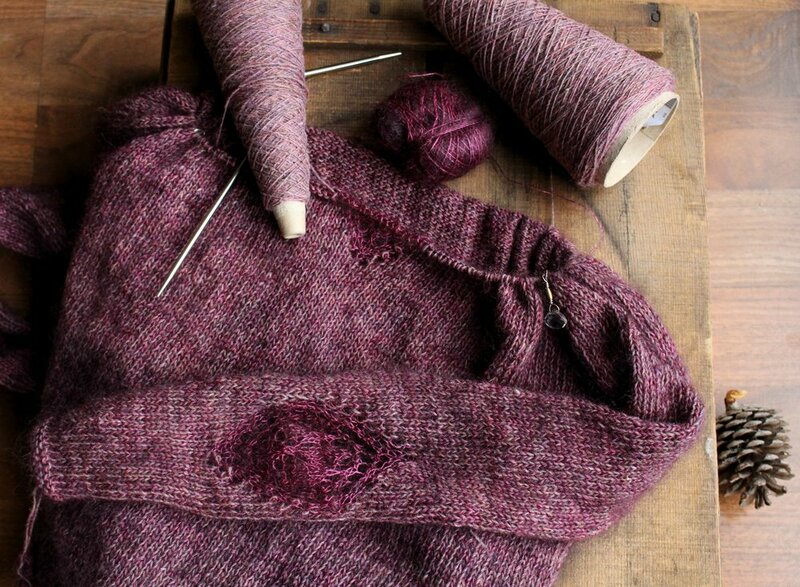 How beautiful is this yarn combination held together? I love the texture and halo it creates! These are two Julie Asselin yarns.. Nurtured Fine and Anatolia. So lovely. I am now working up the pattern and can’t wait for it’s release and seeing it being made in all sorts of color combinations! In other news. It has been an adjustment with no longer having a storefront, but I have still been enjoying collaborating with artists and working on adorable new products for our online shop. Last week we released our new Spring Collection of handmade notions and accessories and I am just simply in love with this collection so much. Although so much of it came from different places and from artists from around the world.. it all works together so well! Everything is bird and nest themed with seems so perfect for Springtime! Today… I added something brand new! That’s right! An owl tin.. with baby owl buttons inside! If you would like to see more please click HERE. I can’t tell you how much joy it brings me to create and bring the knitting community beautiful things.. not only in knitwear but in fun and useful accessories as well.